How do you Reduce Cyber Risk without Increasing the Budget? Criminals are leveraging the connectivity of the Internet to actively engage in corporate espionage and steal intellectual property, engineering designs, customer sensitive data as well as other business and financial confidential information. When it comes to raising IT and cyber budgets, accounting and finance professionals are increasingly being asked to referee and opine on cyber security spending. There is a way to reduce the risk exposure but simply opening the purse strings and increasing the budget is not the solution. For example, a leading international bank, despite spending over $500 million dollars annually on cyber security, suffered a major data breach. Cyber Managements Alliance’s one-day immersive session will equip attendees with practical knowledge about cyber risk, attacks, their real world effect on brand reputation and the financial impact on business. Increasing your security posture on budget with existing resources. The benefits of aligning with international and UK standards including the UK Government’s Cyber Essentials Plus scheme. Are you informed enough to be able to make strategic and operational decisions before and after a data breach? This course will enable you to prepare a defined and managed approach when responding to a data breach or attack of an information asset. The content is intended for senior management and business executives who wish to gain a better understanding of cyber security and the real threats to their organisation. This is not a technical course therefore there are no prerequisites. This training is available as a one-day internal workshop. Information Risk Management, policies and standards. Strategies to protect business reputation, brand image and bottom line. Data Breach Response - strategy, planning and management. Basic awareness on cyber and breach regulatory and legal issues. This course is based on Cyber Management Alliance’s CSPE Course. The CSPE course, Amar Singh, its trainer and Cyber Management Alliance have been awarded the UK Government’s GCHQ-Certified training accreditation, or GCT. Furthermore, Cyber Management Alliance are approved by APMG, the only certification body licensed and approved by GHCQ to deliver this scheme. An awareness-level program intended for those who would like to gain a better understanding of information risk, cyber attacks and how to protect their businesses against cyber criminals. Interactive and immersive with discussion a highly skilled practitioner. Identify, evaluate and treat cyber risk and improve their organisation’s security posture. Undertake responsive measures to reduce business risk exposure to within risk appetite, with constrained resources and within budget. 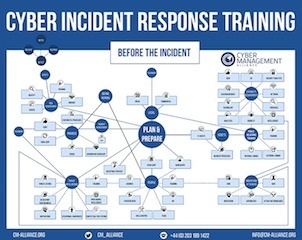 Explain the key differences between the various types of attacks and discuss mitigating strategies. Understand the business benefits of complying with international standards including the UK Government’s Cyber Essentials Scheme, NIST and ISO 27001:2013. Using the checklist to beat the hackers! Amar Singh is a GCHQ Certifed Cyber Security Trainer. Amar has a long history and experience in data privacy and information security training. Amar Singh has served as CISO for various companies, including News International (now News UK), SABMiller, Gala Coral, Euromoney and Elsevier. Amar, amongst various other activities, is a Global Chief Information Security Officer and Trusted Advisor to a number of organisations including a FTSE100 firm and is chair of the ISACA UK Security Advisory Group. Amar also founded the not for profit cyber security service for charities, Give01Day and is an Executive to the Board of the National MBA in Cyber Security. This course is available as an internal one day workshop. Please complete the form below and one of our consutlants will be in touch to discuss your requirements.